English Heritage has a major influence on cultural life. Each year, it awards £30 million towards the restoration and upkeep of historic buildings, monuments and designed landscapes. Furthermore, these symbols of English tradition attract an annual 11 million visitors. 700,000 members support English Heritage. Each member pays a yearly subscription. Most of the organisation’s funds, however, come from private donations, commercial ventures and the Department for Culture, Media and Sport. Applications should also convince English Heritage that other benefits are likely to come from a grant award. These benefits include the development of skills and training; educational and social advantages; partnership working with other fund providers; availability of the building or site to visitors; improvements to the local economy. If a proposal passes these tests, it must meet regional funding priorities. There are nine such regions. Interested grant applicants should contact English Heritage for the priorities that apply to their proposals. Within the East Midlands region, for example, the priorities are grant applications that refer to structures registered as at risk; structures or landscapes that may be able to play a part in regional and local strategies; schemes for managing conservation projects. Finally, any grant application that meets all national and regional priorities should fall into one of the categories given below. English Heritage works with the Wolfson Foundation and the War Memorials Trust to provide grants for the repair and upkeep of war memorials. Anyone interested in applying for funds should speak first to the War Memorials Trust. England has many historic monuments, buildings and designed landscapes. The maintenance costs of these can be huge. 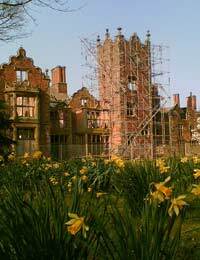 English Heritage grants are available for urgent repairs and conservation work. Grants can also pay for the commissioning of professional reports that outline any repairs and management that a building, monument or landscape may need. Local Authorities can apply to English Heritage for grants that improve, protect and control their historic environments. Grants can cover all or some of the costs of repairs; help to buy historic buildings and designed landscapes; and fund relevant heritage jobs. Any faith group can apply for a grant to assist towards the repair of places of worship. Such places must be listed buildings. Demand for these grants is high. The types of urgent repair that may qualify include repairs to spires, roofs and guttering. The goals of the Regional Capacity Programme are similar to those of the National Capacity scheme. The main difference is that projects should provide information about a region’s specific historic environment. England has monuments in cities, towns, villages and fields. Some, such as burial mounds and earthworks, date back thousands of years. English Heritage management agreements are for the owners and tenants of land on which monuments stand. An agreement applies for either three or five years. Under its terms, a landlord or tenant can receive financial help with repairs and upkeep. This grants scheme gives money for assessing, researching, surveying and developing historic structures and landscapes. It can also fund archaeological projects. Universities, charities, companies and local authorities may apply. Individuals who are interested in such grants must be self-employed. Hi if local council owns a grade ll listed property that is being left in a state of disrepair how I so I go about complaining? It is pointless complaining to the council itself as will get no where but are there organisations covering rules/regulations about enforcing maintainence /repairs that I can contact ? Contact your local authority first of all as they will know of any locally available funding. English Heritage is also worth trying - although it doesn't usually provide funding, it may highlight organisations that can. Hi we live in a Grade 2* listed Mill (Grange Mill, Willington) which has been converted into two properties. We are looking to the following work on the property:Secondary glazing on front windows and bedroom window. Repair of external woodwork and iron railing - where a tree (which has now gone) has destroyed what use to be the original door to the mill. Would we be eligible for any of your grants or would you able to give any advice Many Thanks. Hi we live in a Grade 2* listed Mill (Grange Mill, Willington) which has been converted into two properties.We are looking to the following work on the property: Secondary glazing on front windows and bedroom window. Repair of external woodwork and iron railing - where a tree (which has now gone) has destroyed what use to be the original door to the mill. Would we be eligible for any of your grants or would you able to give any advice Many Thanks . It's unlikely you'd get a grant unless your income levels are low enough to perhaps qualify for some help from one of the energy company's (to improve insulation etc). You could try English Heritage orHistoric England.